Hamilton College defenseman Dylan Lahey '15 (Barnstable, Mass./Barnstable HS) has been selected for the 2015 Eastern College Athletic Conference (ECAC) Division III New England Men's Lacrosse All-Star Team. Lahey was voted to the second team and he is one of 29 athletes on the region's all-star team. The honor is his first from the ECAC. The all-star team award is just the latest for Lahey, who has received plenty of recognition since the season ended in late April. He was an honorable mention selection for the U.S. Intercollegiate Lacrosse Association (USILA) Division III All-America Team and also earned a spot on the USILA Scholar All-America Team in May. Lahey made the NESCAC all-conference first team in April after he was on the second team in 2013 and 2014. 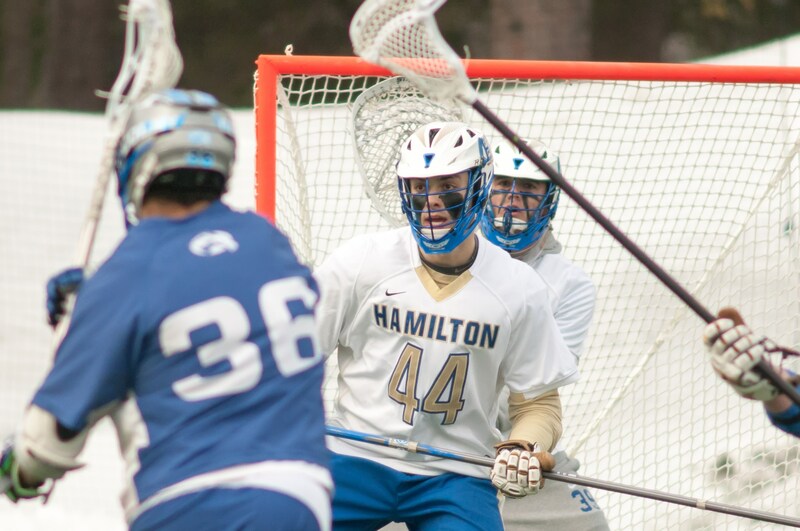 He led Hamilton with 16 caused turnovers and was second with 47 ground balls in 15 starts. He helped the Continentals to an 8-8 overall record and their third NESCAC Championship quarterfinal appearance in four years. In 47 career games, Lahey caused 61 turnovers and scooped up 123 ground balls. He is Hamilton's first three-time NESCAC all-conference selection in men's lacrosse. The Continentals just finished their fourth year in the conference in the sport.